Class for iterating all enum values, from EnumType::enumBegin_ up to, but not including, EnumType::enumEnd_. 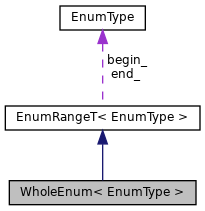 the underlying enum values be represented by continuous values of an integral type. enumEnd_ must have a representation that is one past the last user-accessible value of the enum. Definition at line 219 of file EnumIterator.h. Definition at line 158 of file EnumIterator.h. Definition at line 159 of file EnumIterator.h. Definition at line 222 of file EnumIterator.h. Definition at line 161 of file EnumIterator.h. Definition at line 162 of file EnumIterator.h. Definition at line 163 of file EnumIterator.h. Definition at line 164 of file EnumIterator.h.